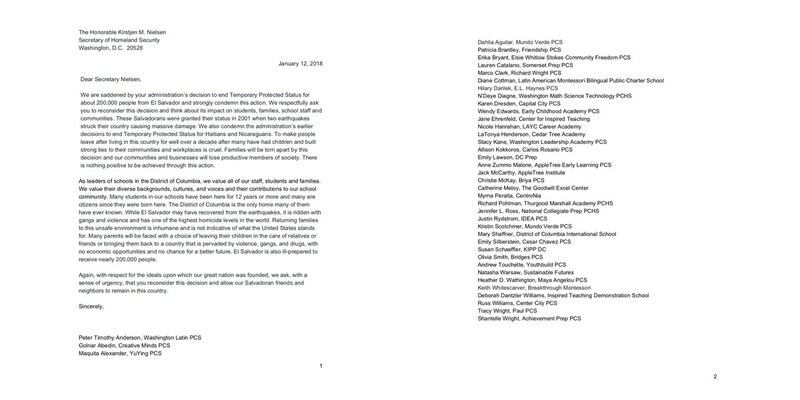 IDEA Head of School Justin Rydstrom signed on to a letter from DC charter school leaders condemning the decision to end Temporary Protected Status for many immigrants. IDEA joined a host of other DC charter schools in writing a letter to the Department of Homeland Security condemning the recent decisions to end Temporary Protected Status for immigrants from El Salvador, Haiti, and Nicaragua. You can read the letter here. 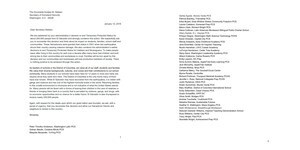 We are saddened by your administration’s decision to end Temporary Protected Status for about 200,000 people from El Salvador and strongly condemn this action. We respectfully ask you to reconsider this decision and think about its impact on students, families, school staff and communities. These Salvadorans were granted their status in 2001 when two earthquakes struck their country causing massive damage. We also condemn the administration’s earlier decisions to end Temporary Protected Status for Haitians and Nicaraguans. To make people leave after living in this country for well over a decade after many have had children and built strong ties to their communities and workplaces is cruel. Families will be torn apart by this decision and our communities and businesses will lose productive members of society. There is nothing positive to be achieved through this action. As leaders of schools in the District of Columbia, we value all of our staff, students and families. We value their diverse backgrounds, cultures, and voices and their contributions to our school community. Many students in our schools have been here for 12 years or more and many are citizens since they were born here. The District of Columbia is the only home many of them have ever known. While El Salvador may have recovered from the earthquakes, it is ridden with gangs and violence and has one of the highest homicide levels in the world. Returning families to this unsafe environment is inhumane and is not indicative of what the United States stands for. Many parents will be faced with a choice of leaving their children in the care of relatives or friends or bringing them back to a country that is pervaded by violence, gangs, and drugs, with no economic opportunities and no chance for a better future. El Salvador is also ill-prepared to receive nearly 200,000 people. Again, with respect for the ideals upon which our great nation was founded, we ask, with a sense of urgency, that you reconsider this decision and allow our Salvadoran friends and neighbors to remain in this country.